When you finally make the big leap to owning your own yoga mat, it can be more than a little disappointing to discover that your so-called sticky mat has no traction at all. Aside from being annoying, if you are really slipping on your mat, you could hurt yourself. There are a few effective ways to break in your new mat, but before you take action it's important to know what kind of mat you have. What Kind of Mat Should You Use? Most slippery-when-new yoga mats are of the basic PVC variety, like a Gaiam mat from Target. Even premium PVC mats like the Manduka PRO can be slippery at first. This is especially frustrating since it feels like you just paid $100 for a mat with no grip at all. Rubber, TPE, and polyurethane mats tend not to have the same initial slipperiness as PVC ones. In fact, great grip from the get-go is a big tick in the plus column for these types of mats. If sliding on your mat is a big problem for you. you may want to investigate one of these alternative materials when it's time to upgrade. Rubber mats include the Jade Harmony and Manduka eKO, TPE mats are made by Kulae and others, and rubber/polyurethane hybrids are offered by Lululemon and Liforme. These types of mats have the added advantage of being biodegradable, unlike PVC. If you're feeling confused about the options, our comparison chart can help. If you already have a PVC mat, do not despair! The main difference between your new shiny clean mat and the well-worn version provided by your gym is obvious: your mat needs to be worn down a bit. You can accelerate the aging process by washing your mat with water. Thin PVC mats (ones you can easily fold up, i.e. not the Manduka PRO) can even benefit from a run through your washing machine's gentle cycle. No soap is necessary and be sure you allow plenty of time for it to air dry. 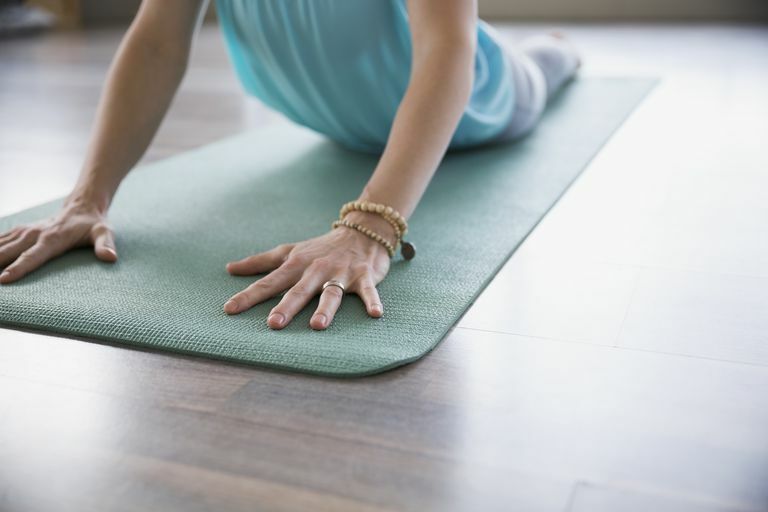 Because yoga mats are absorbent, getting them completely dry can take up to several days. Keep using your mat, and it will soon acquire a slip-free surface. If you have really sweaty palms or feet that are causing you to slip, you may need to use a towel with your mat. Placing a standard hand towel across the front of your mat could be all it takes. You can use it to dry your hands or place your palms on the towel when doing poses like downward facing dog. Just make sure the towel is on the mat so it doesn't slide. If you continue slipping, look into an anti-slip product like the Yogitoes Skidless towel. This type of washable, absorbent towel is designed to be used over your yoga mat for extra traction and is particularly popular for hot yoga practices. There is some pretty bad advice out there about how to break in your mat. Do not use apple cider vinegar, which is a strong acid, to treat or wash your mat. Sunlight and salt will break down rubber, TPE, and polyurethane, and will probably not do much good, even for a PVC mat. Can You Learn Yoga Using an Alignment Mat? Do You Need a Yogitoes Mat Towel for Your Practive?